WMSCOG God the Mother, a hidden secret of the Bible. WMSCOG God the Mother (aka. Heavenly Mother) is a hidden secret of the Bible allowed only to those who receive all wisdom and understanding from God by partaking in the New Covenant Passover established with Jesus’ precious blood(Eph. 1:7). The World Mission Society Church of God (WMSCOG) established by Christ Ahnsahnghong is a church strictly following the New Covenant truth such as the Passover and Sabbath day etc., based on the Bible. As all we know, the Bible is the most widely read book of all time in the world. Nevertheless, not many people understand the contents of the Bible nor do they follow its teachings, not even Christians who want to live by the word of God. Then why should we know the Bible? The “Bible” which is a basis of Christianity was recorded to let us know about “Christ” who is Elohim God ( Gods ) ; God the Father and God the Mother coming to this earth to save all mankind. We can find many records about God the Father easily in the Bible, however not many records about God the Mother. Why is that? The truth of WMSCOG God the Mother is a hidden secret of the Bible allowed only to those who receive all wisdom and understanding from God by partaking in the New Covenant Passover established with Jesus’ precious blood. Ephesians 1:7~9 In him we have redemption through his blood, the forgiveness of sins, in accordance with the riches of God’s grace that he lavished on us with all wisdom and understanding. And he made known to us the mystery of his will according to his good pleasure, which he purposed in Christ. This time, Let us check the existence of God the Mother through the prophecy about Adam and Eve. WMSCOG God the Mother : The prophecy of Adam and Eve. 1.Eve, bone of my bones and flesh of my flesh. God made Adam from the dust of the ground and Eve from the rib of Adam as a suitable helper for Adam. And Adam referred to Eve as ” Bone of my bones and flesh of my flesh “. Then why did God make Adam from the dust of the ground ? And Why did God make Eve from the lib of Adam? This is not just a story about first man, Adam and Eve. This is a prophecy revealing God the Father and God the Mother Mother who appears in the last days and gives eternal life to mankind. To clearly understand this, let us first find out what the will of God was in creating Adam. Adam is a pattern of the one to come, namely, Adam is a figure that represents the Second Coming Christ who appears in the last days. (Revelation 22:20) And that’s the reason why the Last Adam is a life giving spirit. 1 Corinthians 15:44~49 it is sown a natural body, it is raised a spiritual body. If there is a natural body, there is also a spiritual body. So it is written: “The first man Adam became a living being” ; the last Adam, a life giving spirit. The spiritual did not come first, but the natural, and after that the spiritual. The first man was of the dust of the earth, the second man from heaven. As was the earthly man, so are those who are of the earth; and as is the man from heaven, so also are those who are of heaven. And just as we have borne the likeness of the earthly man, so shall we bear the likeness of the man from heaven. Just as Eve was created after Adam in the six days of creation so God the Mother, the reality of Eve appears after the appearance of the Second Coming Christ (Last Adam) in the end of six thousand years of God’s salvation work. 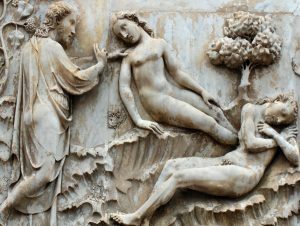 Let us find out more about Eve through the Bible. In the six days of creation, Eve who was created on the last day is the mystery to solve. When Jesus who is a prophetic Adam came to earth 2000 years ago, He did not appear together with His wife Eve. What is the reason ? 1 Corinthians 5 :7 Get rid of the old yeast that you may be a new batch without yeast–as you really are. For Christ, our Passover Lamb, has been sacrificed. In the Bible, Jesus is likened to more than one and all the parables which are the prophecies of the Bible are closely connected together. Here, Jesus is likened to the Passover Lamb. Numbers 9:12 They must not leave any of it till morning or break any of its bones. When they celebrate the Passover, they must follow all the regulations. The Bible says that any of the Passover lamb’s bones must not be broken, and Jesus appeared in this world as the reality of the Passover Lamb. As prophesied in the Bible (Numbers 19:12), any of Jesus’ bones wasn’t broken unlike the other criminals crucified on the cross. However, from a prophetic point of view, without Adam’s bones being broken, Eve cannot be created. In other words, the reason why the prophetic Eve didn’t appear at Jesus’ first coming is because any bone of Jesus who was also the reality of the Passover Lamb, wasn’t broken at that time. Therefore, in order to entirely fulfill the prophecy of the Bible, Jesus must appear once again in the flesh as the Last Adam, not alone, but along with His bride, the Last Eve. Here, the Lamb is the Second Coming Christ. Finally the bride who did not appear at Jesus’ first coming was ready to appear in the last days. Considering the prophecy about Adam and Eve, God who is Almighty could have made both of them from the dust of the ground simultaneously, but God made Adam from the dust of ground and Eve from the rib of Adam after creation of Adam. It is because God wants us to realize the existence of God the Father and WMSCOG God the Mother appearing in the last days for giving us eternal life through the prophecy of Adam and Eve. Then who is giving us eternal life in the age of Holy Spirit ? In the age of Holy Spirit, the Spirit and the Bride give us water of life. The water of life means eternal life and only God can give us. So we can understand that the Last Adam and Eve appears as the Spirit and the Bride in our time. Since the Bride is the wife of the Lamb(Rev.19:7), the Spirit indicates the Second Coming Jesus(Last Adam) and His Bride (Last Eve) indicates WMSCOG God the Mother who is mother of our souls. As prophesied in the Bible, now our God the Father and God the Mother appear together and give us eternal life in our time. The things that no one else can do. Why did Adam’s bones have to be broken ? In fact, God would have been able to appear in this world without breaking His bones or tearing out His flesh. Ahnsahnghong and WMSCOG God the Mother have come to this earth in the flesh such as our likeness leaving behind the heavenly glory for looking for us. 2000 years ago, WMSOG God the Father was nailed to the cross by His hands and feet instead of us, and allowed us the New Covenant Passover with His precious blood shed on the cross. Even today, He appeared a second time with new name, Christ Ahnsahnghong for our salvation. Christ Ahnsahnghong did masonry work at daytime struggling with a heavy chisel and hammer , and wrote the book of life at night with calloused hands. And our Heavenly Mother now dwells among us and is caring for members of the World Mission Society Church of God (WMSCOG ) around the world without any rest. Who else but WMSCOG God the Mother can breathe life to Her children dying due to their sins? However it hurts to see Her go through all the suffering by Herself. This entry was posted in God the Mother and tagged god the mother, God the Mother Beliefs, God the Mother Bible Truth, god the mother church, god the mother church of god, god the mother in korea, God the Mother Revelation, god the mother verses, god the Mother youtube, heavenly mother, heavenly mother jerusalem, heavenly mother korea, Jerusalem mother, the prophecy of wmscog, the spirit and the bride, truth of god the mother, truth of wmscog, wmscog beliefs, wmscog god the mother, wmscog heavenly mother, wmscog sermon, wmscog truth, world mission society church of god, world mission society church of god beliefs. Bookmark the permalink. ← WMSCOG Sermon, The Last Age to Seek God the Mother. We cannot get eternal life without Mother spiritually . If you don’t know you should check it out thru the bible. Without God the mother, we can’t receive the eternal life. Thanks for meeting Heavenly mother. Amen! How blessed we are! Wow, The trurh of WMSCOG God the Mother is so deep and meaningful! Where else can i learn about this kinds of truth except the Church of God? Right. How deep the prophecy of God the Mother is! There are no churches that can explain about God the Mother through the bible. It is very interesting that Eve represents God the Mother. Amazing! Yes. I agree. I’m also did not never heard. Before the begining of the world, God the Mother who gives us eternal life and blessings existed in the whole universe. God the Mother can never forget the lost children, sinners, and promised to come to this sinful world for us with endless love. I give thanks and glory to our God the Mother , the source of life. When we see mother in this earth we can understand this easily. The love of God the Mother who is the reality of mother in this earth is amazing. When we see the picture of the flower, we could say color or shape is beautiful but we could not feel smooth, smell and so on. But its reality is awesome!! It couldn’t be beyond comparison. How amazing the love of Heavenly Mother is!! So I am soooo happy that I come to know, receive God the Mother!! Yes, it is a message of hope to 7 billion people! Let us boldly preach about God the Father and God the Mother. Heavenly mother, she is an eternal life. Yes, according to the Bible, we can understand that through Jesus blood we can receive wisdom and its way is to drink the Passover wine which represents Jesus’ blood. Whenever studying the Bible, it’s amazing and I thinks that our Savior God is great!! God the Father sacrificed Himself and shed His precious blood. It is only to give us all wisdom and prudence that can help us to realize God the Mother who is the source of eternal life. How thankful it is!! He has made us know His will and purpose. Not all the people living on earth, but only those who remain in Jerusalem!! It is only Adam who can reveal God the Mother who is reality of Eve in the last day. Thanks to God the father, Christ Ahnsahnghong for letting us know God the Mother ! Eve represents God the Mother who appears in this age and gives us eternal life with Adam who represents Second Coming Christ, God the Father. Who can realize such a deep and mysterious truth? Our father, Ahn Sahng-hong, came to this earth and made us known. Because it is so certain truth, we believe in the heavenly mother whom the Father has testified. Only people who believe Heavenly Mother can enter the kingdom of heaven. She is the water of life. whoever come to Heavenly Mother, receive holy water of eternal life. Just as our physical life is given by our physical mothers, our eternal life is given by our God the Mother whom Eve represents. Christ Ahnsahnghong let us know God the Mother as Adam named Eve. Without God the Mother no one can receive eternal life. Let us believe in God the Mother! This is an amazing truth which God let us know for our salvation. I give eternal thanks to Christ Ahnsahnghong and God the Mother. Bible said, in order to get knowledge and wise spiritually, we have to realize christ. Furthermore, The reason why we deligently study Bible is that get salvation and foreverlife. Therefore, without realize heavenly mother through in this era, we are not able to get our spiritual goal , namely , salvation and forever life. Yes!! The Bible testifies about our Savior. In other words, if we want to receive eternal life and go to the kingdom of heaven, we should acknowledge our Savior and the way to eternal life through Him. The Bible testifies about God the Father and God the Mother in the age of Holy Spirit even though the existence of God the Mother is hidden for ages it’s time to be unhidden. How deep & wide truth is! It’s an important message for our salvation. Thanks to Father & Mother. It is clear that God the Mother gives us eternal life. We have to receive Her in this age. Thanks to Elohim God for having me wmscog. Truly God the Mother is the last hidden mystery who can give eternal life to us. God Ahnsahnghong came as last Adam and revealed to us the last Eve God the Mother. We must come to Mother to receive eternal life in heaven. All prophecies of the Bible are closely linked together and reveal to us the existence of God the Mother as well as God the Father. The prophecy of Last Adam and Last Eve is one of them. Thanks to Father and Mother for this precious truth giving us wisdom. Through the prophecy of the last Adam and the last Eve, we come to meet our God the Father Ahnsahnghong and God the Mother in this age of Holy Spirit. I give all thanks and praise to Elohim God who let me know and receive Them. This truth about God the mother is amazing. I can almost perfectly understand about spiritual meaning of Adam and Eve. In this age, Last Adam and Eve appeared to fulfill the prophecy of the Bible. Let’s believe in both of them, the Spirit and the Bride who give us eternal life. this article is so interesting and very helpful to understand about the Bible. The story about Adam and Eve is not just a story but a prophecy so we can well realize that our Heavenly Father and Heavenly Mother appear as the Spirit and the Bride who give us eternal life. There are God the Father and God the Mother according to Adam and Eve who God created. Heavenly Mother gives us the way to eternal life. People who want to go to Kingdom of Heaven have to seek God the Mother. I was shocked to find Eve in the Genesis stood for God the Mother in the Revelations. I’m very honored to be with Her in this life. That’s why Adam and Eve are one body. Likewise, God the Father and God the Mother are the one. Thanks to Fathe and Mother, we able to understand all the truth and we can go to eternal kingdom of heaven. When we see the copy of something we can estimate what the reality is. Likewise through the Adam and Eve who are the copy of the image of Elohim God we can understand our Spiritual Father and Spiritual Mother. I have wondered who is the woman confronting dragon in Revelation chapter 12 until now. How can just a woman be match for dragon? In case there is, she must be a mother who has her dear children. I give all thanks to Heavenly Mother so much. Without knowing Mother we can not get a salvaion and going to Kingdom of heaven. This is very very important thing for our salvation. let’s believe in Elohim God. God the Father and God the Mother. There’s no life without mother. How did every person come to be born? Many things in this world is a shadow of the heaven. Life – the most important thing without exception is no need to say. Only thing that man can’t do is to give birth to a child.As mothers on earth give physical lives for their children,so our spiritual Mother that Eve stands for gives us eternal life. Amen. Eve represent God the mother, the wife of God the father. We can easily understand that with the Bible. Thanks to God to let me know this truth. How deep and amazing God’s will and prophecy in creating Adam and Eve! God the Mother is already planned to appear in these last days after coming of Christ Ahnsahnghong. Thanks to God Elohim for Their coming in the flesh according to the prophecies to save us, sinners. Through the prophecy about Adam and Eve, we can understand Heavenly Mother who appears in the last age. Nothing can repay God’s love. I just only give thanks to God. Spiritual Eve is God the mother according to the bible. We can not deny the heavenly mother if we believe in God sincerly and trust in the bible. Absolutely!! From the time when God created everything, God the Father and God the Mother existed. So from the book of the Genesis to the book of the Revelation, the Bible clearly testifies about this. So clear!! How so profound the bible is! Humans can not calculate the depth of words of God. God has covered how to receive the salvation in Eve who was created in the last day of creation work and revealed it through the hidden secret, Eve. The last secret of the Bible is ‘God the Mother’ who is to appear in the flesh in this last age. Whoever realizes this hidden secret comes to receive eternal life according to the Bible. This will be understood only by heavenly children who need Her earnrst love. And, it’s Elohim God’s grace! The knowledge of God the Mother is not from men, but from heaven! Not everyone is allowed to have this knowledge. With this, we can walk the living way to heaven’s kingdom. According to the Bible, Last Adam(the Second Coming Christ) is a life giving spirit, this means Last Adam give us eternal life, but we should not forget the fact that there is also Last Eve who is a suitable helper for Adam, So as prophesied in the Bible, She appeared in our time and will finish the redemption work by giving us eternal life. This is the greatest secret that we must not miss. Amen! If we believe in God the Father, we must know what the Father’s will is. God the Father wants us all to have eternal life from God the Mother. In order to do so, we must fully believe in God the Mother who our Father has revealed to us! Our heavenly Mother is completing work of salvation on this earth with all Her heart and efforts. Let us children of God the Mother help Her with all our heart and efforts. The last Eve who is giver of eternal life should appear with the last Adam. The last Adam appears two times on this earth. First, as Jesus 2000 years ago, second, as Christ Ahnshnghong. I’ve never thought such a deep meaning about Adam and Eve…! I want to know more! Thanks!